David Cutcliffe is best known as a coach for his work with quarterbacks, so much so that Duke actually emerged as a legitimate contender to land Braxton Miller before he decided to stay at Ohio State. However, Cutcliffe has talked this offseason about running the football and how he believes that the best way to consistently be good and put yourself in positions to win is to be good running the football. Also, with Duke replacing its best quarterback-wide receiver combo in years this team may just be born to run. Line play is the most important aspect of any offense’s running game, and replacing a consensus All-American like Laken Tomlinson up front won’t be easy for the Blue Devils. 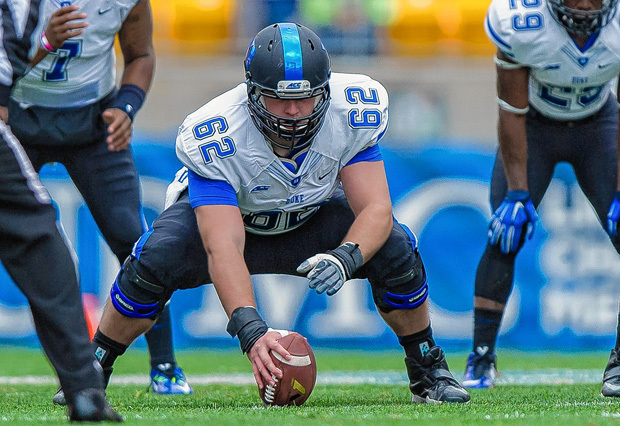 The player that Duke will need to lead this offensive line is center Matt Skura. Skura has 27 career starts and is Phil Steele’s preseason 1st team All-ACC center. He also has help from fellow senior and returning starter LG Lucas Patrick. Duke also has a pair of running backs that should be able to exploit the holes the offense opens for them. Shaquille Powell returns after leading the team with 618 rushing yards last year, and the team gets a boost from Jela Duncan’s return from a season-long suspension. Duncan rushed for over 500 yards in 2013. Both of these guys were solid ypc guys too, with Powell at 4.6 last year and Duncan an even five in 2013. One place they do need to improve is the touchdown department. They only have five combined touchdowns in their last respective seasons of playing. The receiving corps will have to find some new pieces after the loss of 1,000-yard receiver Jamison Crowder, and second leading receiver Issac Blakeney. It will help to get Braxton Deaver back. Deaver, a tight end, missed all of 2014 recovering from ACL surgery, but had 600 receiving yards in 2013. At wide receiver, Max McCaffrey will step into a more prominent role as the starter after catching 37 passes for 385 yards, and redshirt freshman Chris Taylor has won the other starting receiving gig. Anthony Boone departs from Duke as one of its most accomplished passers of all-time, leaving behind some pretty big shoes that need filling. Thomas Sirk should be the guy tasked with filling them. Sirk has played minimally behind Boone, but in 14 pass attempts last season he completed ten of them for 67 yards and three touchdowns. He’s also a running threat, especially in the red zone. Sirk rushed for eight touchdowns last season. 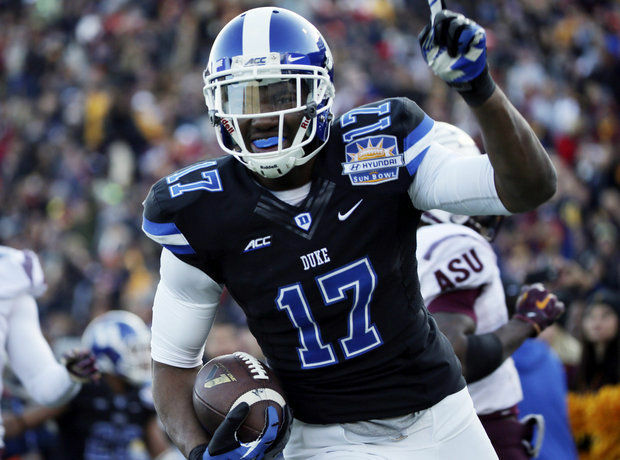 The Blue Devils just might have the best safety duo in college football. DeVon Edwards had over 100 tackles at safety last year, seven and a half of which were behind the line of scrimmage and four and a half of which were sacks. Edwards also picked off a pass, broke up nine more and forced five fumbles. Plus, he made Phil Steele’s first team All-ACC list as a kick returner. Oh, and he might be the second best safety on the team. Jeremy Cash was a wrecking ball (© Miley Cyrus) in the defensive backfield last year. Cash had 10.5 tackles for loss, 5.5 sacks, two interceptions, seven passes broken up, and four forced fumbles last year. Thanks to that, he has shown up on not just every preseason All-ACC team, but several preseason All-American lists. It also helps that the other three starters in the secondary all return too. (Note: Duke runs a 4-2-5). Previewing Duke’s front six starts off with a sad note. Kelby Brown was supposed to return to start at linebacker after missing all of 2014, but Brown suffered a torn ACL in July ending his college career. That’s definitely sad news for Brown and the Blue Devils. The injury to Brown also lowers the experienced Duke linebacker count to three. Chris Holmes, Dwayne Norman, and Zavier Carmichael all played in all 13 games last season, but only combined for 52.5 total tackles, 5.5 tackles for loss, and three sacks, all by Norman. The defensive line situation isn’t much more promising, if at all. Carlos Wray returns to the interior line, but is the only real returning starter, although other defensive tackle A.J. Wolf was third among defensive linemen in tackles last year. One major issue for this defense going forward is going to be rushing the passer. Wray and defensive end Kyler Brown are the only returning linemen to record a sack, and they only had 2.5 combined. Duke’s secondary is good, but nobody can sit in coverage all day and shut down a decent passing attack. Cutcliffe has done a truly remarkable job with this program. The present stretch is the best three-year mark for this program since the 1930s. It’s also the first time Duke has had back-to-back winning season’s since the ’80s when Steve Spurrier was in Durham. However, there are enough question marks here that a mild regression seems likely, even with a manageable schedule. The schedule is favorable enough that Duke could reasonably push to nine of ten wins, but I’m afraid that the question marks up front defensively and in the passing game may come back to bite them a few times, even with the playmakers in the secondary.